Join the Excitement of Collecting Breyer Horses! 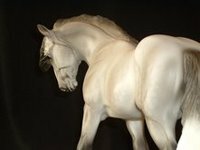 At Breyer Horse Collectors we welcome anyone engaged in the adoption, admiration and storytelling of model horses. We are particularly fond of Breyer Horses, and we look forward to learning from and sharing with many types of Collectors from all walks of life! We hope you’ll to become a part of our web family - we've got our welcome mat out for Model Horse Collectors from all over the world! We know in talking to Model Collectors that determining the value of Breyer Horses is a top question that can be difficult to find the answer to. Sign up and we will send you a FREE REPORT that will help you determine a fair price for a Breyer model. Join us and together we will find out more about this hobby known as Breyer Model Horse collecting. Our door is always open. After you have read through all the pages on this site, we do recommend a couple of great books for you as wll. One is Felicia Browell's "Breyer Animal Collector's Guide: Identification and Values" especially if you are just getting started with your Breyer Horse Collecting. This guide has great photos to help identify your models with approximate values. Another great book we highly recommend for the Collector who really wants to know all the details of Breyer Models from the beginning is "Breyer Molds & Models" by Nancy Atkinson Young. Nancy's book is priceless with the detail it covers and is now out of print. However, every now and then you will find it on eBay; and if you can find the 5th Edition, go for it. It covers all models made from 1950-1997 and is a treasure trove of information. Create Your Own Page on our Website!! CLICK HERE for details on how you can showcase YOUR Breyer Pictures and Stories on our website! Latest Breyer Horse Collector News! Breyer Stablemates - Multiple Generations! JAH 2005 Special ASB release - Glossy Florentine! Deb Marshall attends the Velvet Rope Event! How much is my Breyer Collection worth? What's the fuss about Breyer's Silver Snow? Find out.